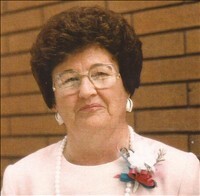 Madge Elaine Draper Hansen,88, of Twin Falls, died Sunday, January 15, 2012, surrounded by her loving family. She was born December 21, 1923, to Birdie Maude Headrick and Willis Draper in Bellingham, Washington. She grew up in Mansfield, Washington where she met Ruel M. Hansen. They were married July 26, 1941, in Coeur d' Alene, Idaho. Following Ruel's service in World War II they resided in the Mansfield area until 1952, when they moved to Rupert to farm. Madge moved to Twin Falls following Ruel's death. She enjoyed activities with her family, especially traveling throughout the U.S. and Canada. She went on her first cruise in 2009, but her favorite destination was always the ocean. She was a member of the Rupert First Christian Church. Madge is survived by her three daughters, Kay (Dwight) Tucker of Twin Falls, Rae (Perry) Meuleman of Rupert, and Mary Jo (Jim) Bulawa of Redmond, WA. She had eight grandchildren and 13 great-grandchildren. She was preceded in death by her parents; her sister, Dorothy; her husband; her grandson, Kevin; and great-granddaughters, Macy and Kayla. Funeral services will be held 11:00 a.m. Wednesday, January 18, 2012, at Hansen Mortuary, 710 6th St in Rupert. Burial will follow at the Rupert Cemetery. A viewing will be held one hour prior to the service at the mortuary. In lieu of flowers, donations may be made to a charity of your choice.